This is an album of 21 paintings and drawings in chronological order of friends and family who posed for me or gave me a photograph, most recent first. I like switching from watercolor, to oil, to egg tempera and pencil since each technique has a different language and purpose. If you would like to have a portrait, there is a contact sheet on the bottom of the page. One day David was working on a project so I took a snapshot and made a painting out of it. I was interested in the technology. My son in the park, a studio painting. A large egg tempera studio painting on canvas; commissioned portrait from a snap-shot of a very significant other. He gave it the title. Isabel, the mother of my son’s best friend. She posed for me every day for about a week. She wanted me to shorten her neck, but I liked the long neck look. This is a large studio painting of my son with a friendly black and white cat in Cantalojas. 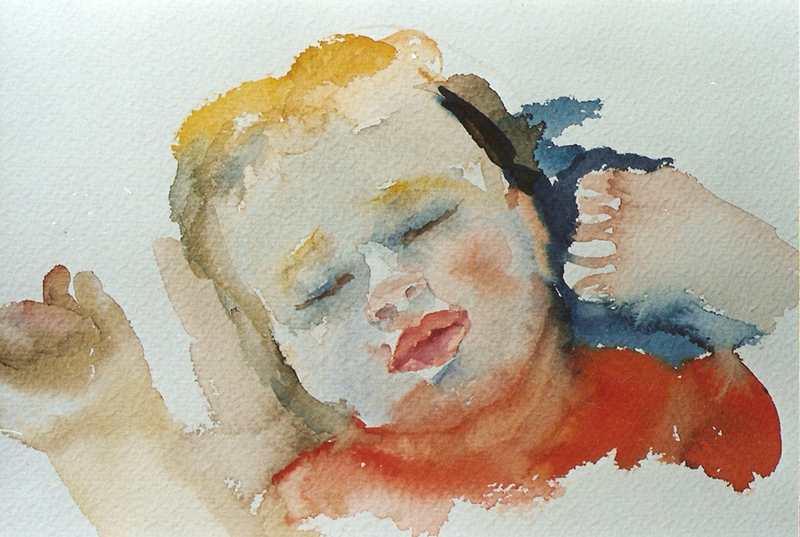 My son while he was sleeping, painted it in 2000. I’m really glad to have this moment on paper. And this one too. I’ve made a lot of paintings and drawings of my son since he was born. This is a new-born painting; less than 15 days. This is me and below is my cousin. My Cousin 1996 – egg tempera on canvas – large and lost. My cousin posed everyday for about a week. The time between when I gave the painting to her in hand, and the next time I spoke to her – It, the painting, got lost. A mystery to this day. My Aunt and her baby daughter; in the Alameda evening California natural light. My good friend Alerie, in the painting she’s wearing bright red clothes, but I only have a black and white of this painting; it’s hers. Maybe we’ll run into each other one day. I wanted to do a painting about Cleopatra getting bit by a poisonous snake and my friend posed for a few sessions. I like my Mom and Dad’s wedding pictures. It’s a good topic to practice pencil on paper since it take a lot of hours to do. I met Alerie at SFSU. The last thing I heard from her is that she was living in NY. This is a drawing from a picture I took of her in the stairwell. I was living on campus at SFSU when I made this wood cut. I wanted to do a Klimptish style here of this very extravagant guy I met there. Another good friend Leasa, this is a portrait of her on a wood-cut. It is quite large since it’s bigger than life. One of my favorite people has this painting and I’m glad. Julia, a very interesting person and photographer I met in San Diego. A great model. I remember that she didn’t move until I finished. I met Stasha in 1985 at Grossmont College. She had fashion and design in her head all the time. Now she runs an interesting clothing shop. She posed for me me one day and now her mother has it. This is a sanguine pencil drawing of my Great Grandmother Agustina in Malaga, Spain. I was staying with my family in Malaga in the summer of 1983. My Grandmother, Maria de Laguno Zuzuarregui, Posed for me for quite a long time here in Madrid. I was living with my Grandparents at that time.